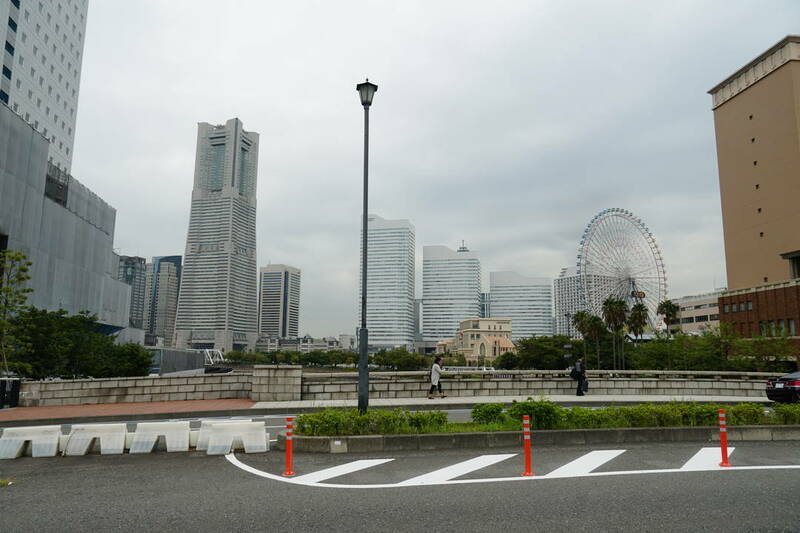 [Yokohama Bashamichi; Explore History By Walking]How about a stroll about the historical city celebrating its 150th anniversary to trace the age of enlightenment? The symbol of enlightenment from Meiji era and on, Yokohama. 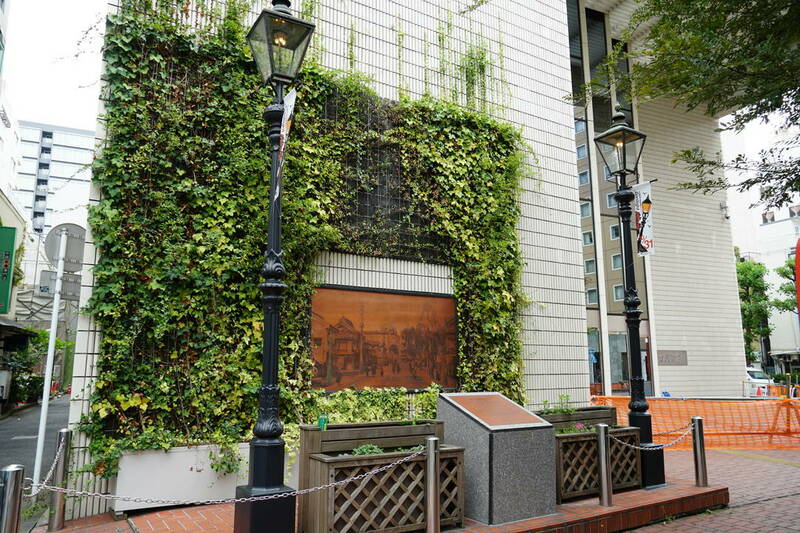 [Bashamichi Shopping Avenue], an area celebrating its 150th anniversary offers attractions such as historic spots, edifices, and food related to Yokohama’s history that can be enjoyed while taking a stroll. On the street where many historical buildings remain, you will find many monuments commemorating birthplace of things unique to Bashamichi, home of modern culture; you can also enjoy public art and eateries with a long history. 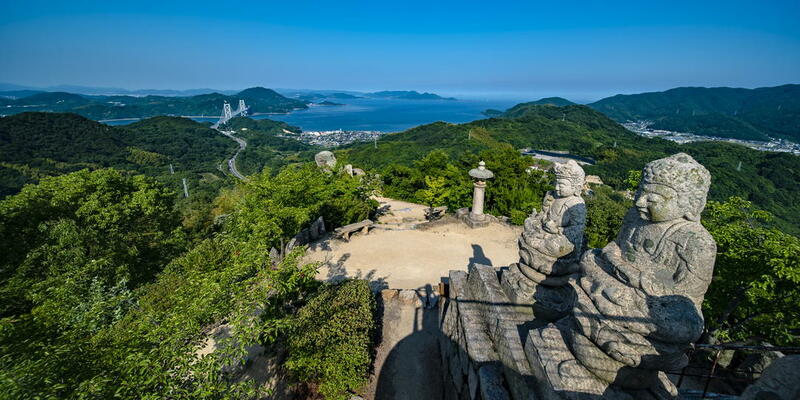 In this article, we will introduce a walking route to tour historic buildings and historical sites; simultaneously, in related articles, we will explore a variety of ways to enjoy Bashamichi with so many faces! Kannai Station had served as the gate of Bashamichi Shopping Avenue for a long time, until Bashamichi Station of Minatomirai Line was constructed in 2004. This was where the checkpoint used to be at the time the port was opened, and you will see the area has been an important point for traffic. So, let's start the tour from this Kannai Station! 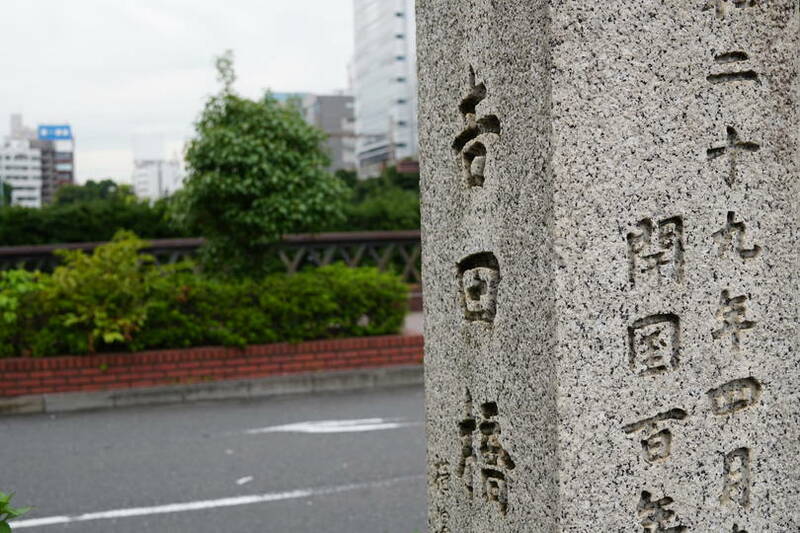 Symbol of enlightenment; "Kane-no-hashi (iron bridge) Monument (Yoshidahashi)"
Yoshidahashi had a gateway established at its foot at the time the port opened. As Japan opened itself to the world in Meiji period, the bridge was revamped with Japan’s first truss structure method by R. H. Brunton, a British civil engineer. At that time it was called “Kane-no-hashi (iron bridge)” and was commonly known as a symbol of enlightenment. The current balustrade was reconstructed resembling “Kane-no-hashi” in those days; now it is regarded as a historical site “Yoshidahashi-kanmon-ato (ruins of Yoshidahashi gateway)” along with “Kane-no-hashi Monument,” handing down the spirit of Meiji to present. It is said that a tree-lined street developed to strengthen cityscape beauty in a city where overpopulation was expected due to modernization. The first tree-lined street in Japan actually derived from this Bashamichi. 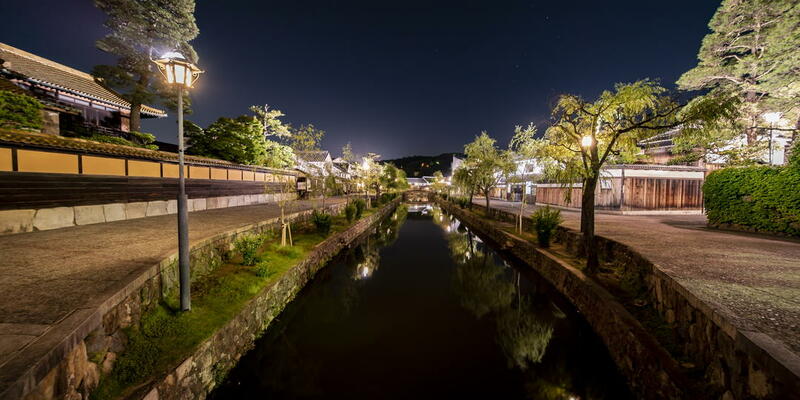 It is said that modern tree-lined street began when stores at Bashamichi planted willow and pine trees to make a nice-looking cityscape in 1867 (3rd year of Keio). 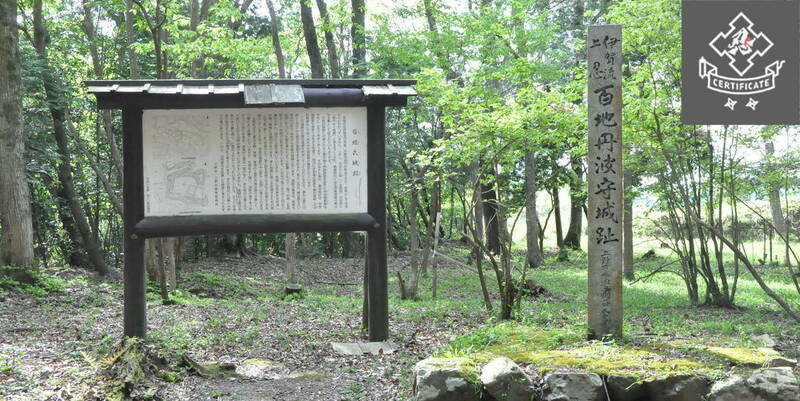 Aside from tree-lined street, Bashamichi is a site where many modern cultural components originated. It's also nice to visit a number of monuments related to such theme. 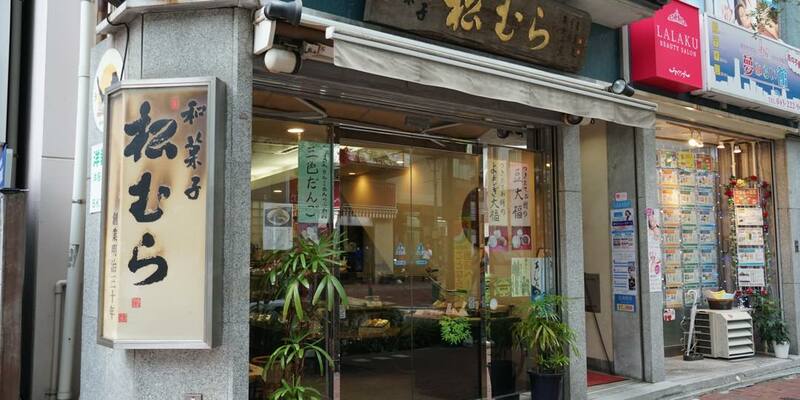 “Izuhei” is a restaurant specializing in inari-zushi, located at the intersection near the gateway of Bashamichi Shopping Avenue. This business was established in 1839! That is, the 10th year of Tempo, when Tokugawa Ieyoshi was the ruler of Edo. Izuhei’s inari-zushi--which has been popular for a long time--is in a characteristic elongated form. It was formed in such a long and narrow shape so that dockers who worked at the time the port opened may eat easily with one hand. To suit the laborers’ taste, its inari-zushi is made with abura-age (deep fried tohu) boiled in strong, sweet sauce and vinegared rice seasoned only with refreshing vinegar; they make a great pairing! Izuhei’s thickly seasoned inari-zushi is so yummy, you could eat it forever. How about getting one when strolling about the alley? 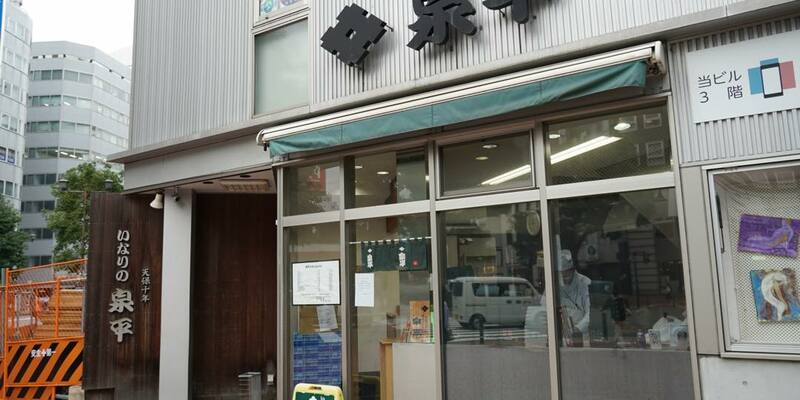 Here is a long-established store of Japanese sweets that continues from Meiji, “Matsumura.” It was founded in Meiji 30. They say the store welcomes numerous customers from various schools of tea ceremony. There is a diverse lineup of products that makes even professional Japanese tea masters admire, such as jo-namagashi (premium fresh confections, upper picture), Bashamichi Manju (sweet buns) optimal for souvenirs (bottom picture), higashi (dry confections), yokan (sweet azuki bean paste jelly bars), and local confections designated by the prefecture. You will surely be paralyzed with so many choices. Did you know the first store that sold ice cream in Japan was located in Bashamichi? It all began when Machida Fusazo sold them as “Aisukurin” in Meiji 2. 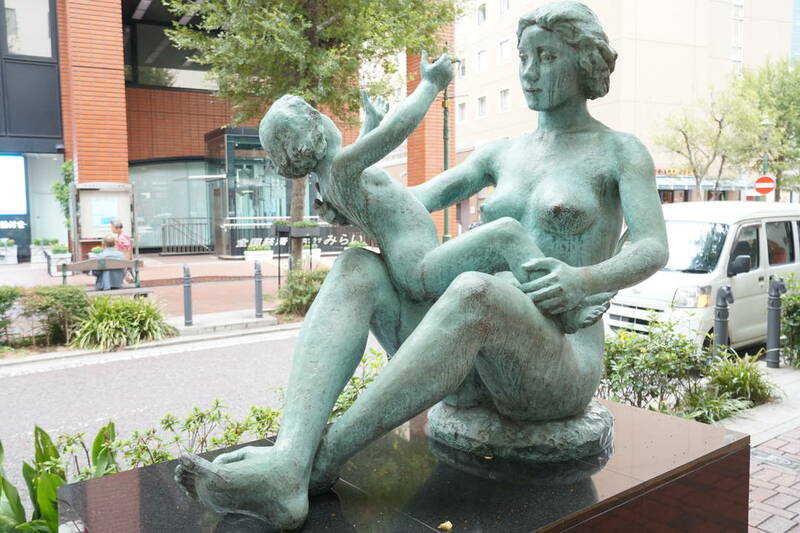 There are many theories to where the store was actually located; however, there is a statue called “Taiyo-no-boshi-zo (statue of mother and child in the sun)” in the neighborhood. Speaking of things imported from abroad, you will come up with infrastructure which was introduced since Meiji Restoration. First gas light in Japan was lit up in Bashamichi by “Nippon Gas Shachu,” a gas company owned by Takashima Kaemon in Meiji 5. It is said that the pillars where imported from Glasgow, UK, while lightning appliances were created by craftsmen in Japan. This monument and gas light were created resembling the original form to celebrate the new construction of Kannai Hall. 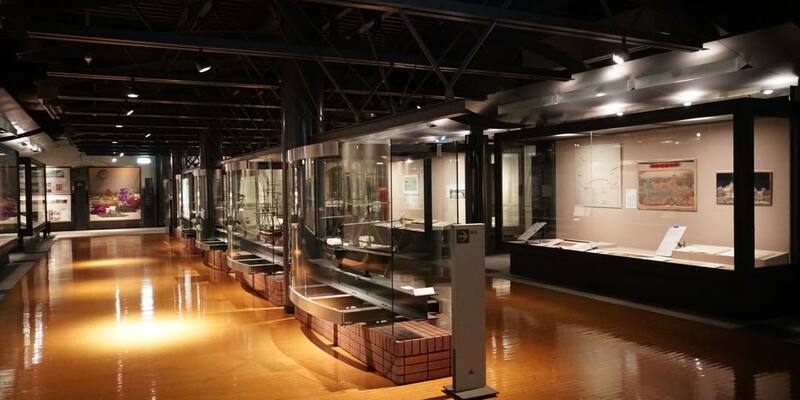 By the way, the engravings on the wall were made transcribing postcards owned by Yokohama Archives of History; they exhibit Bashamichi in the end of Meiji era, and are worth seeing. Heiandoo-yakkyoku is a well-established business established in Meiji 3 as Kinokuniya-yakuho that has added years in tandem with Bashamichi. 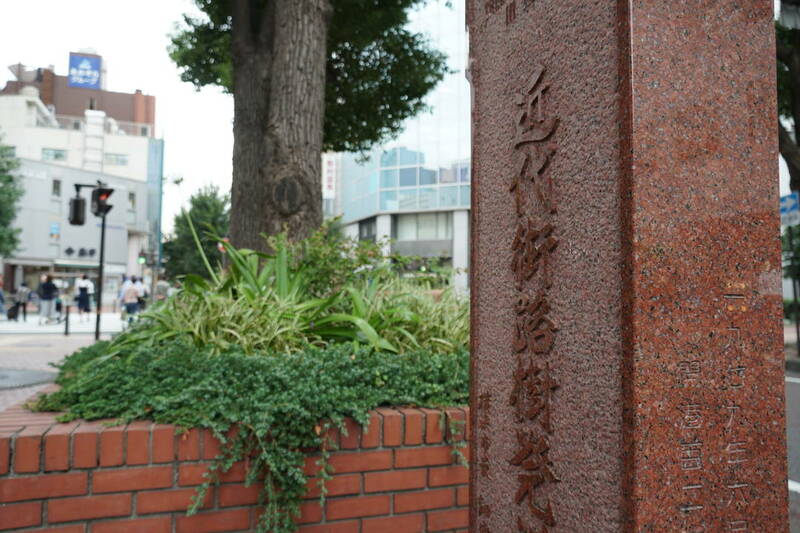 Eisuke (Shintaro), its second generation, is one of the pharmacists who passed yakuho-kaigyo-shiken, the first national examination for pharmacists. At that time the store had a traditional pharmacy style, but Shimizu Totaro, the third generation, turned the trade’s direction to a western-type structure. The business is known to commit to Chinese medicine, too. 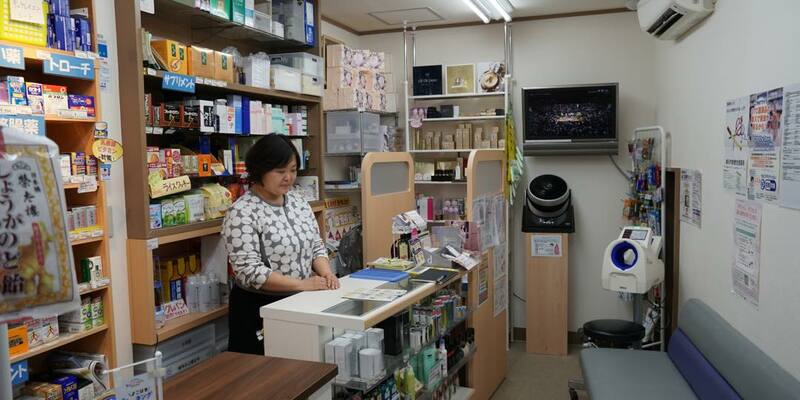 Nowadays, the pharmacy is loved by locals as a “pharmacy next-door” supporting their wellness with knowledge of both western and Chinese medicine. Currently, it is constructing a new branch along Bashamichi scheduled to be finished by 2020; they say somehow at the secluded provisional store you can eat ice cream... We will get to that story next time. 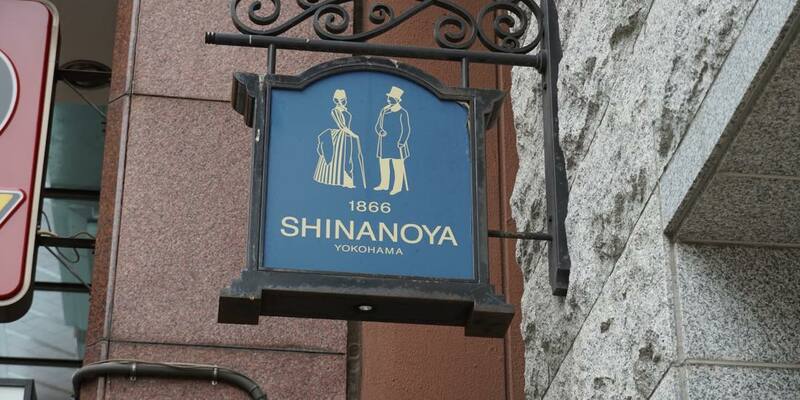 “Shinanoya” is said to be the oldest boutique in Japan, founded in Keio 2 (1866), in the late Edo period. While it was common in Yokohama at that time to export Japanese silk and etc., the boutique’s founder, Yoshizawa Chojiro, launched the store thinking from a different angle, by selling imported western goods. Subsequently, with the advance of adoption of western clothes for Japanese citizens, Shinanoya keeps its operation as it is, as a foundation of Japan’s Western apparel. The starting point of Shinanoya is a voluminous dress called bustle-line making the hip look larger which was popular in so called Rokumeikan period. In Shinanoya today, classic dresses are available for rent including dresses reproduced based on dress lines at that time. * The dresses on the picture are sample products and not available for rent. Another significant feature of Shinanoya is that it has a lineup of products that you can get glimpses of time transition from the early Meiji period to today. You can see production and limited sales of timeless clothing items such as garters (made in England) used for socks at the time when socks didn't have an elastic band and precise replicas of military coat, which has become the basis for trench coat. That is why Shinanoya has been loved for a long time. Nipponkoa Bashamichi Building has a rare architecture with a hybrid of the buildings at the time of the opening of Yokohama Port and modern buildings. It is a Neo Renaissance style building built in 1922. It was built as former Kawasaki Bank, Yokohama Branch but renovated in 1989 leaving some parts of the building as they were. 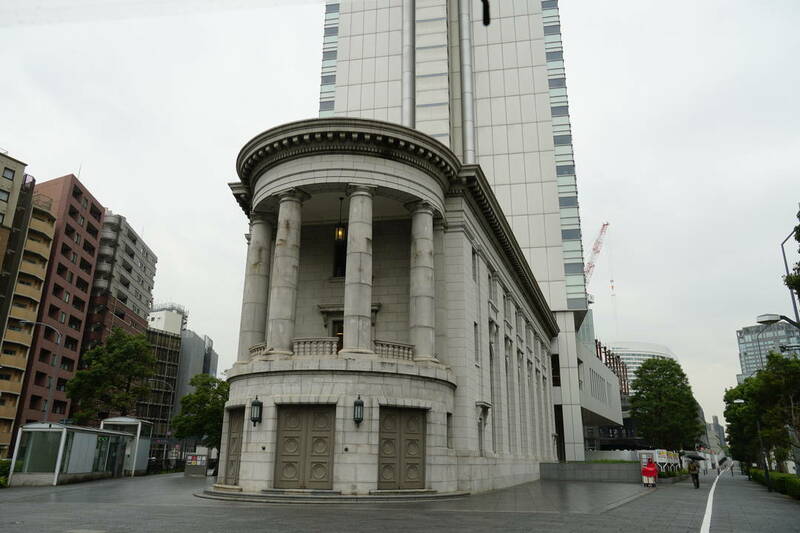 It is recognized as the first historical building in Yokohama city due to the historical value and visual appeal of the great mixture of modern architecture style and Neo Renaissance style at that time. Shimooka Renjo Kenshohi (Honoring Monument of Renjo Shimooka), a monument honoring a pioneer of Japan’s photography. Renjo Shimooka is a photographer with a background in painting. He is called as a pioneer of Japan’s photography because of his achievement in establishing the occupation of photographer in Japan. 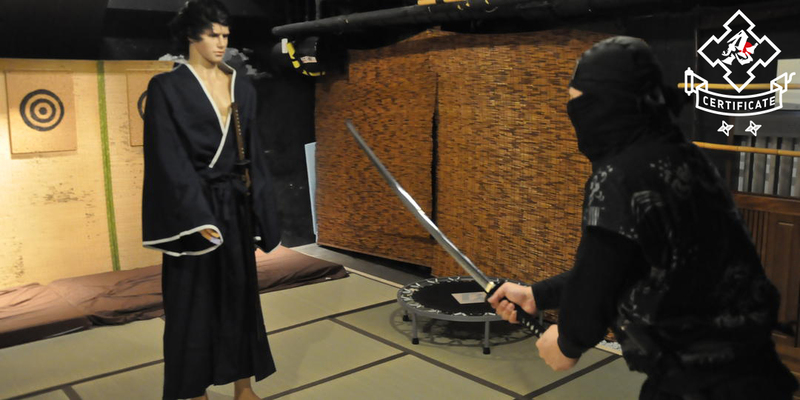 There is no doubt that his booming photo studio in Bashamichi made photography take root in Japan. Shimooka raised many disciples and made efforts in introducing many photographic techniques. This monument was raised closed to where his photo studio used to be to honor his achievements. 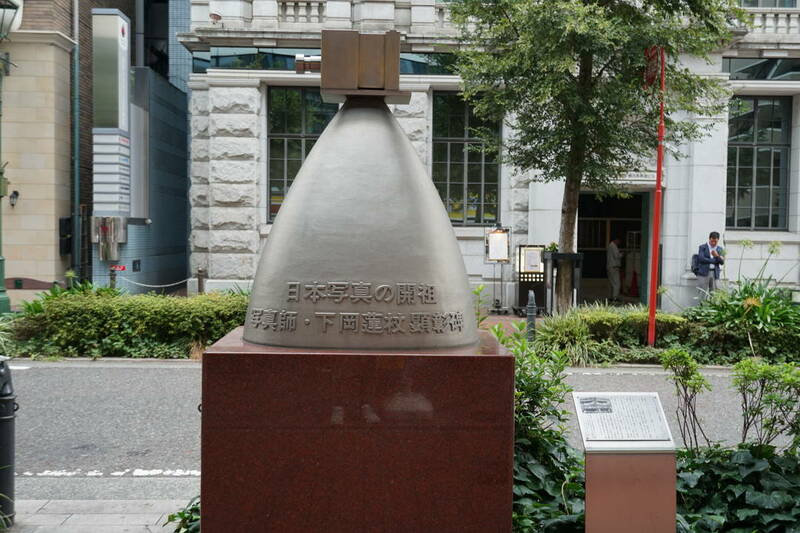 The unique bullet shaped monument with a camera of the day on the top gives a distinctive feature. Kanagawa Prefectural Museum of Cultural History retains its Meiji modern architecture as a cultural history capital. It was built as the head office of Yokohama Specie Bank, Ltd. in 1904 and was reborn as a museum run by Kanagawa prefecture. Although this building designated as national important cultural property and historic remains when it was open lost the dome part due to the Great Kanto Earthquake, the lost dome was rebuilt in 1967 at the same time of the opening of the museum. The whole building was also renovated and the current front gate was expanded at the same time. One of its appealing features is that the whole building still remains the Neo Renaissance architecture as it was in Meiji period. What is great about the building is the historic architecture with rustica masonry forming the foundation and various decorations. Tokyo University of the Arts (former Fuji Bank) has a dynamic architecture with the four pillars. This impressive palace like building with four pillars and rustica masonry was built in 1929 as the former Yasuda Bank, Yokohama Branch. Then, the bank was renamed and it became the former Fuji Bank, Yokohama Branch. 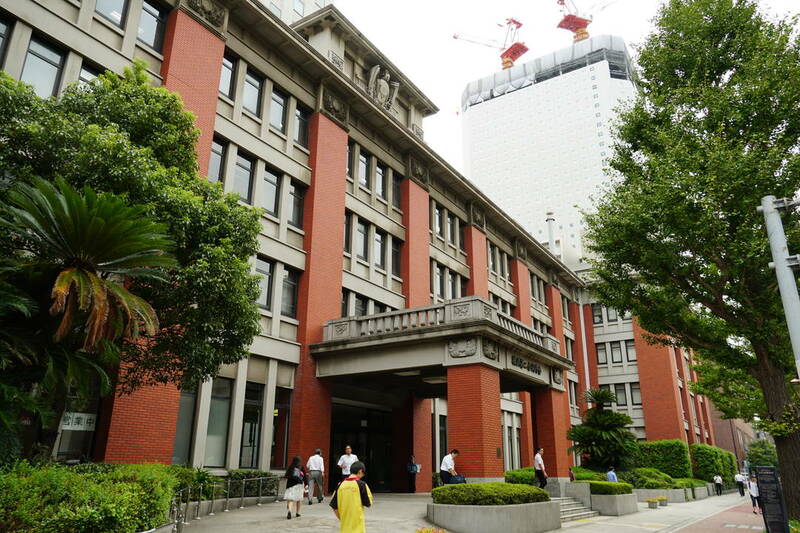 It was in 2005 when it became Bashamichi Campus of Tokyo University of the Arts. It was designated as Yokohama Historical Building in 2003. It was established in 1926 after the Great Kanto Earthquake. The building called as the largest concrete building in the postwar period in Yokohama was built as the second Raw Silk Inspection building. 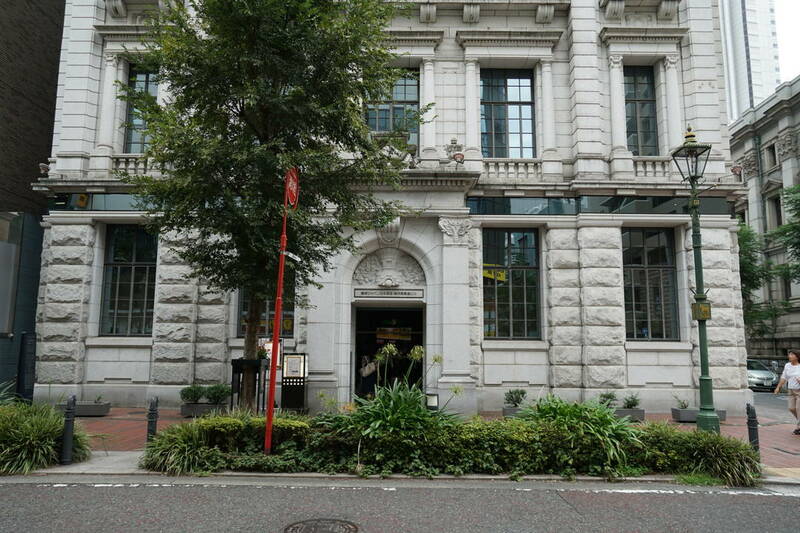 The current building is actually a replica; the first building was torn down once when the Second Yokohama Joint Government Office was built and only the exterior was restored to its original style. It is still designated as Yokohama Historical Building in 1990. It was the first Bankoku-bashi bridge that was built in accordance with the establishment of Yokohama Port Shinko Pier built between Meiji and Taisho period. The current bridge is the second one established in 1940. With the increase of the traffic, the first one was expanded and the intensity was increased. The stone masonries on both sides of the bridge were not changed when the second bridge was built and therefore it retains the original look of the first bridge. 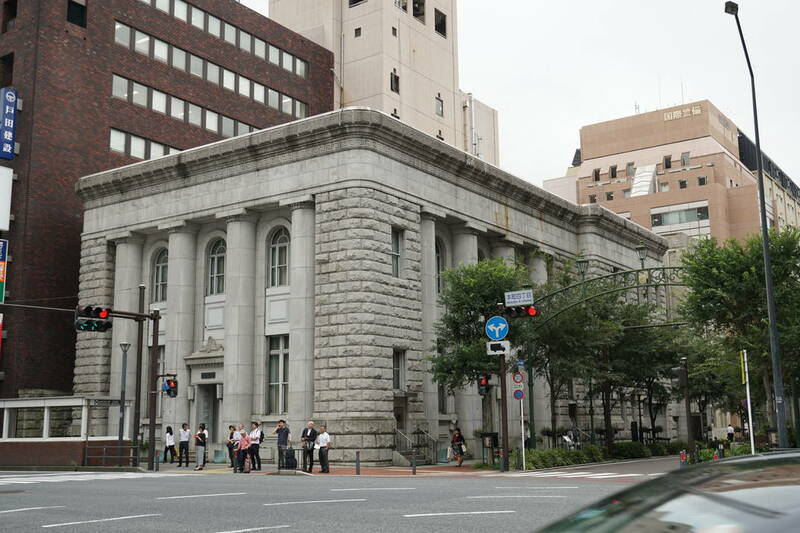 This building currently used as YCC Yokohama CreativeCity Center, a base of creative activities as the center of Creative City promoted by Yokohama city, was built in 1929 as the former Dai-ichi Bank, Yokohama Branch. One of its appealing features is the ancient Roman style architecture called “Tuscan order” with a feature of semicircular balcony with intimidating pillars when you look at it closer. 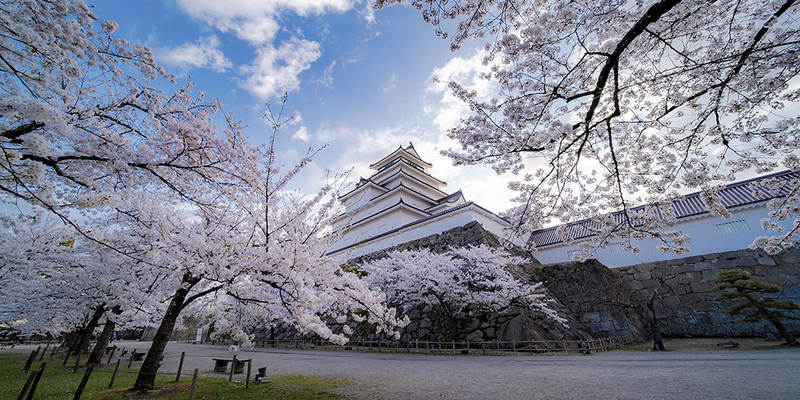 Bashamichi, a symbol of the Civilization and Enlightenment of Japan, is especially a place where many historical assets still remain. Isn’t it very interesting to see the historical contents of Bashamichi which saw the transitions from Meiji to Taisho, Showa and Heisei?